Raf and Charlie talk water, iron, and samurai before discussing the state of the 'Dudes on a Map' game. October 2017: Jason Taylor (JT) from G-Club interviews Jon Lonngren from Fallen Dominion Studios about their new game Fallen Land: A Post-Apocalyptic Board Game. 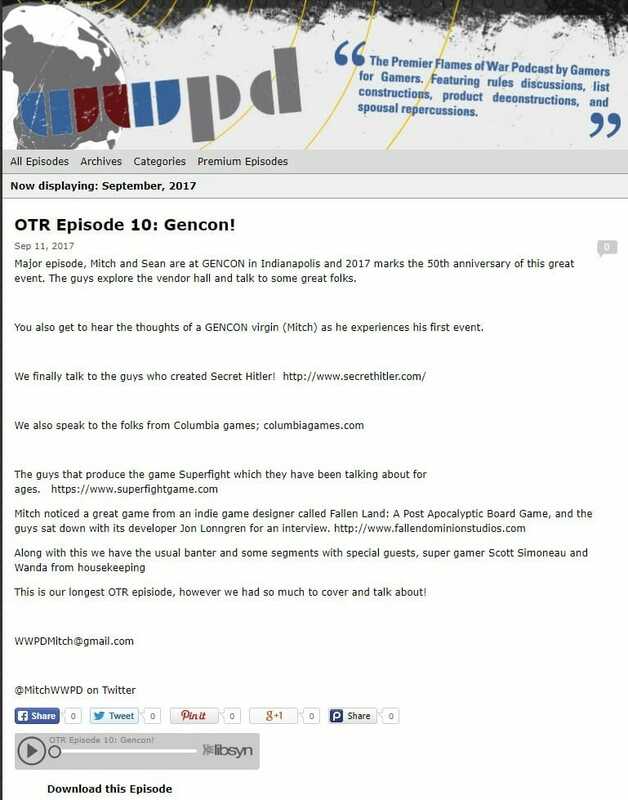 OTR Episode 10: Gen Con 50! Major episode, Mitch and Sean are at GENCON in Indianapolis and 2017 marks the 50th anniversary of this great event. The guys explore the vendor hall and talk to some great folks. 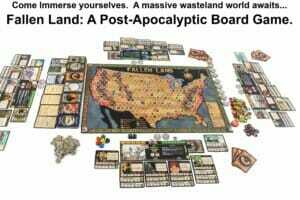 Mitch noticed a great game from an indie game designer called Fallen Land: A Post Apocalyptic Board Game, and the guys sat down with its developer Jon Lonngren for an interview. Fox 28 News and KCRG Channel 2 coverage of "Created In The Corridor," With Scott Sanborn. January 2018. 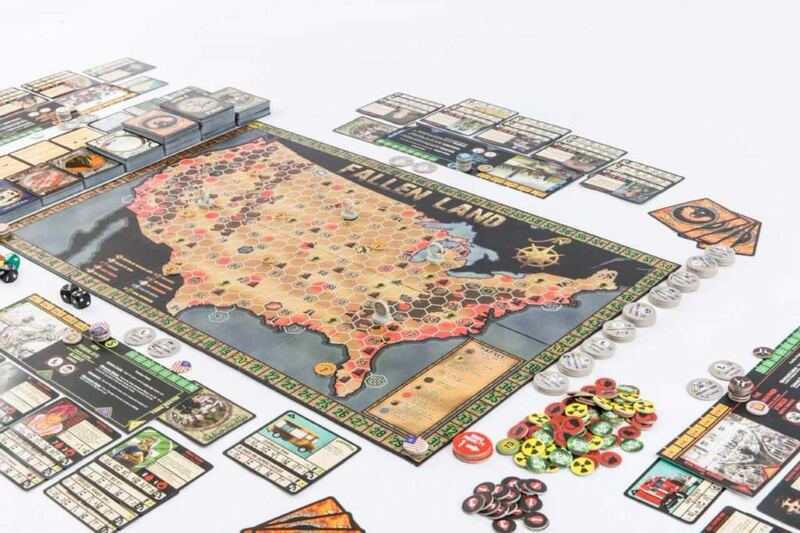 Prime Time TV News Coverage of Fallen Land: A Post-Apocalyptic Board Game and its first expansion, A Journey Into Darkness! 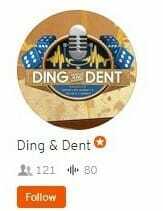 November 2017: For the 66th episode of Podcast at Ground Zero the topic will be Fallen Land: A Post-Apocalyptic Board Game. The Show Hosts Jarred Wallace and Adam Scott Glancy Interview Jon Lonngren from Fallen Dominion Studios. Discusses the studio and Fallen Land: A Post-Apocalyptic Board Game and its first expansion, A Journey Into Darkness. First Clip: Discusses the studio and Fallen Land: A Post-Apocalyptic Board Game and its first expansion, A Journey Into Darkness. 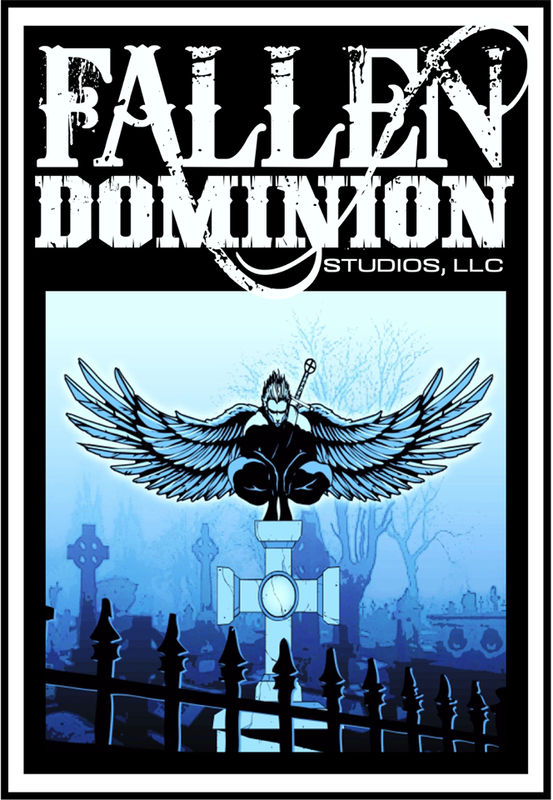 July 2016 (Pre-Kickstarter): Duz-T and Pat(rick) interview some of the Fallen Dominion Studios Crew about FALLEN LAND: A POST APOCALYPTIC BOARD GAME, a game that's 11 years in the making! Special Guests: Jon Lonngren, Warren Ripley, Patrick Phillips, and Bill Pitcher. Gen Con 50, 2017 Interview: Forrest Bower, from Bower's Game Corner Interview's Jon Lonngren CEO of Fallen Dominion Studios about the game. August 2017: Let's go down to the table and take a look at Fallen Land: A Post Apocalyptic Board Game. Special thank you to Jon Lonngren from Fallen Dominion Studios for taking the time to show us his game! We stop in to take a look at this game which caught our eye, Fallen Land: A Post-Apocalyptic Board Game! Their world is an awesome place, so this game really needed closer inspection. Gen Con 49, 2016 Interview (during Kickstarter)Forrest Bower, from Bower's Game Corner Interviews Jon Lonngren CEO of Fallen Dominion Studios about the game.